Sometimes you get the right pattern, you buy the perfect fabric… and it’s a disaster. At some point in everyone’s sewing history they will make a complete duffer and it goes straight in the bin – it happens and that’s ok. However, I am trying to make a more concerted effort to reuse things if possible, and if not I will recycle them, even me-made clothing. Does anyone else find that hard to do when they’ve spent hours on a project?! Being more conscious of waste means that even projects that were duffers can be given a fresh lease of life. Last year I made a simple black and white spotted Seamwork Adelaide and loved it, immediately visualising a whole wardrobe of them. At a sewing meetup last year I picked up this beautiful patterned viscose in Barry’s for about £6 a metre and made an identical Adelaide to wear to SewBrum. The fabric sewed up like a breeze, and I did a little bit of pattern matching across the coloured stripes just to make it look a little nicer. I even ignored the buttonholes and sewed the front plackets together to make it a pop-over like my first version (lazy shortcut but it works). The only difference between this one and my first version was that I cut it a little bit too short, oops! I was quite pleased that I managed to find a coordinating bias binding from my stash to use, and I found these lovely matte navy blue buttons in my local market. It’s such a beautiful fabric and I was really please with how it turned out… and then I wore it. I wore it to SewBrum and felt uncomfortable all day. I don’t know if it was the lighter colour palette on me, the pockets or the (in hindsight unfortunate) tights/boots combo I was wearing with it, but I just didn’t feel very ‘me’ in it, so it ended up on the clothes rail and was ignored for many months. I loved the fabric too much to throw it away, so as part of my June sewing goals I decided to refashion it and try to make it wearable again. After thinking about how to reuse it best, it became clear that the easiest refashion would be to turn it into a top, so I did! I cut off about a foot (30cm), unpicked the pockets and sewed up the gap in the sidereal, overlocked the raw bottom edge and turned the hem once to make it neat and now I’m much happier! 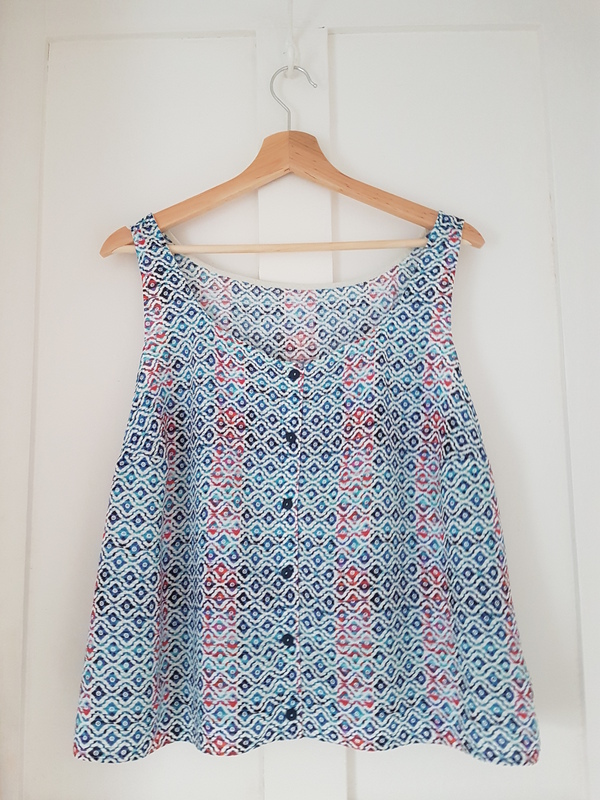 At this cropped length it’s a really sweet little button front shell top, so it’s worth keeping this in mind if you like a good pattern hack. I will definitely revisit the Adelaide pattern as it’s a really great shape, but I think for me it works better in darker colours. Do any of you have any patterns that just seem to work better in a darker colour palette? I don’t wear a lot of pastel tones generally (although I love them so maybe I should; I might need to re-acclimatise after years of dark and bright colours!). Maybe it’s a blonde haired phenomena, but I’d be keen to read your thoughts! Yep! You are absolutely right, this has definitely happened to me. 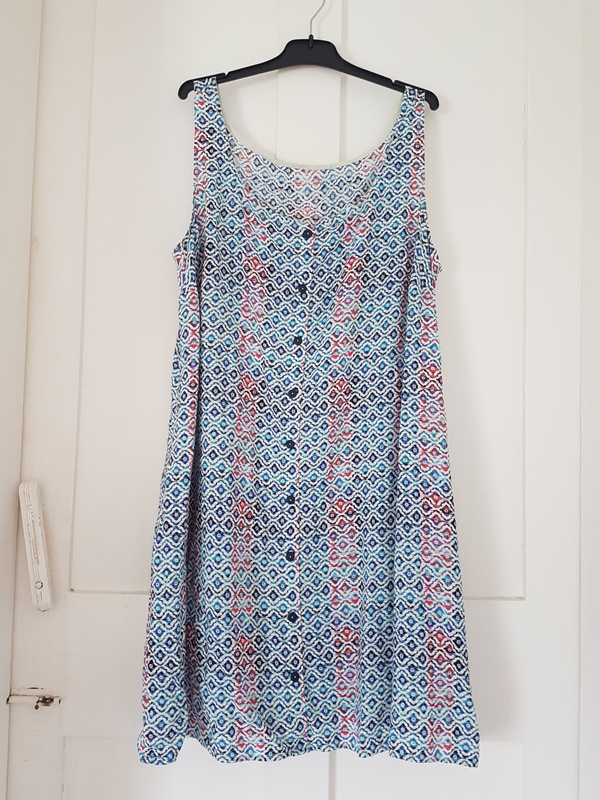 I recently finished a Colette Sorbetto that I will never wear, and it is in my scrap pile waiting to become facings or pockets! I think your refashion looks great! Pretty, flowy, fabric.